In ROBOTILL POS applications no keyboard is required as the apps are 100% touch screen friendly with its own on-screen keyboard. ROBOTILL is however also designed to work very well with a keyboard. We will discuss some keyboard shortcuts and tips on how to use the keyboard more effectively in the POS applications (this does not apply to ROBOTILL Manager). Note: Some of the functions are not available in the workshop module. DOWN ARROW = Main Screens: Move the selection in the grid down. Menu and Selection Screens: Move focus on buttons down. UP ARROW = Main Screens: Move the selection in the grid up. Menu and Selection Screens: Move focus on buttons up. LEFT ARROW = Menu and Selection Screens: Move focus on buttons left. RIGHT ARROW = Menu and Selection Screens: Move focus on buttons right. ENTER = In most screens it will press the default button or select the selected item. ESCAPE = Main Screens: Log off. Lock Screen: Close Application. Most other screens it will be a cancel. To log in, from the secure mode screen just press ENTER. Type in your PIN and press ENTER (or swipe/scan your card). Type the Barcode, Stock Code or description and press ENTER (or scan the item). Repeat the previous step for all the items. Press F5 to complete the sale. Type the amount and press ENTER (for a cash sale). Press ESC to log off. As you would have noticed by following the steps above, ROBOTILL has been designed to work very will when you choose to use a keyboard. 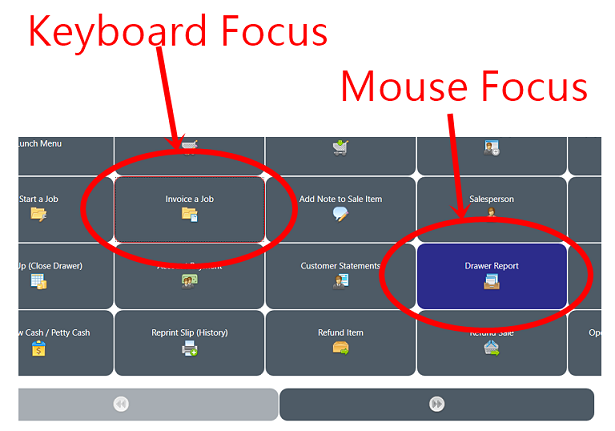 You can follow similar steps in the restaurant module however some actions in the restaurant module does require a mouse or touch screen as you need to select tables and items from different categories. To open the Menu press F4. You can use the arrow keys to move to the required menu item. The item that has focus from the keyboard has a red border - press ENTER to select that item or use the Arrow keys to move to the item you want. The item that will be selected from a mouse click will have a dark blue colour. To move to the next page use PAGE-DOWN. To move to the previous page use PAGE-UP. The same applies to any screen that will pop up a selection of buttons you can choose from. Both the product and customer selection screens will remember your previous search selection. For example if you used customer name to search the previous time, customer name will again be selected. When the screen opens you can then immediately type the customer name (or whatever search option you preferred) and press ENTER. The results will be listed in the grid. Press the DOWN-ARROW to select the first item and use the DOWN-ARROW and UP-ARROW to get to the item you want. Press ENTER to select the item.